Sparkling Wine Cocktails! 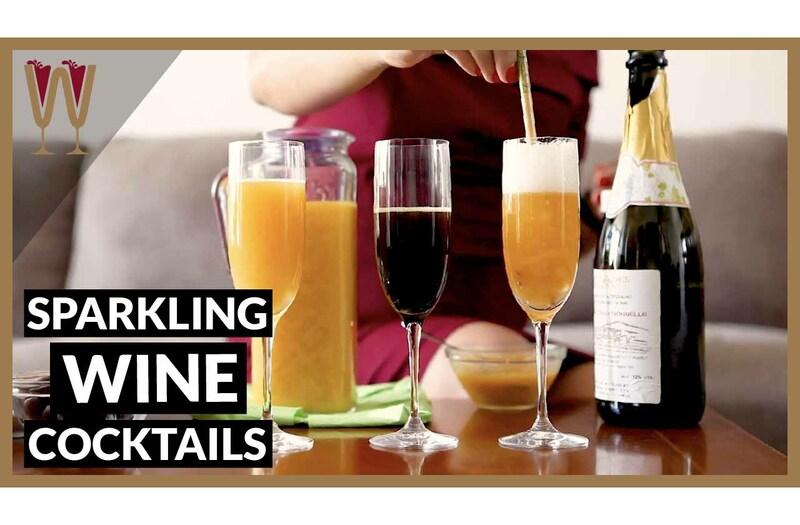 In this video WineScribble shows 3 easy sparkling wine cocktail recipes, including the classic Mimosa (which is a prosecco and orange juice cocktail), and the legendary Bellini cocktail (which is a prosecco cocktail with peach). These easy cocktails recipes are equally good with any sparkling wine and for any season including summer! However, in true WineScribble style, the trip to the wine shop to buy the Prosecco turns into an epic adventure. Will WineScribble manage to get to the party in time? Good morning, Tasters! Today is a very special day. My friends Hans and Helga are celebrating their wedding anniversary ten years on. I was there when they met. And I was there when they got married. I can’t believe it’s been ten years and today I’m hosting a small celebration. Just six of us, the closest friends who attended their wedding ten years ago. We’re all coming back to my house today for a little brunch. Hans and Helga had a special request. They asked me to cater the event using just Cypriot products, which I’m very happy to do. So today I’m serving Halloumi cheese, Kefalotiri cheese, a very dry smoked bacon called Bosirti, wine cured Lountza which is sliced pork loin, Hiromeri, our own version of prosciutto. Lots of lovely food. And, I cannot wait to share it with my friends. I am feeling unusually well organised this morning. I prepared all my platters from last night. So, all I have to do today is chop up some fresh vegetables and pick up a bottle of fizz. So here’s the thing. We haven’t, all six, been together since this wedding ten years ago and we all agreed that we’re going to wear the same outfits. So, we’re all showing up to this brunch dressed in ball gowns and tuxedos. It’ll be fun! This is a Coast dress, this material is called Duchess Satin. I love this design these darts are so shapely, and this colour, this colour, I especially love. Sometimes it looks like Bordeaux, sometimes it looks like Burgundy, but it always looks great. Of course I’ll be changing shoes! These are nowhere near high enough. When I wear high heels I do it like I mean it! Hey guys! I’ve got about two hours left. I need to run off to the wine shop to pick up a bottle of Prosecco. Prosecco is not Cypriot, I understand. The original event ten years ago had a bartender. The easiest solution to this problem is to make some sparkling wine cocktails. Which basically involved putting something at the bottom of a flute and topping up with bubbles. Even I can manage that. I should be there and back in less than half an hour, which leaves me with plenty of time to get ready and all glammed up in my Coast dress. And, I might even have time to have a cup of coffee and read the newspaper. So I’ve decided on three sparkling wine cocktails. I am going to make a Mimosa. A Mimosa is really, really simple. Equal parts freshly squeezed orange juice and sparkling wine. That’s your Mimosa. The other cocktail I’m going to make is a classic Bellini. And again very, very simple. All you need is the pulp of a peach or a nectarine, and you spoon a little bit into the bottom of a champagne flute and then you top it up with some sparkling wine and you stir. That’s your Bellini. And the last one, the last one is a little bit more exotic, because what I will do is use some pomegranate molasses. A deep ruby red syrup, pomegranate syrup into the bottom of a champagne flute, and again top it up with some sparkling wine. I need to take this call you guys so I’m afraid I’m gonna have to stop the car. Hi, yes! I’ve been expecting your call. So the good news is I’ve been waiting for this phone call and I’m really excited. Can’t wait to go to this winery! However, we now have less than 40 minutes left to get this bottle of sparkling wine. Let’s go! Oh my goodness that was not a good sound. It sounds like there’s a problem with the back wheel. I’m gonna have to check this out! I’m going to have to change the wheel! Well that was unexpected. Now, I have about 20 minutes left. There’s no time for me to make it to the wine-shop! Here’s what I’m going to do. I’m still on the beach road, so I’m going to go to the tourist supermarket and I’m going to pick up any bottle of bubbles. Guys! Look what I found! So, I was hoping to find a bottle of Prosecco, but I found something that’s even more appropriate for this occasion. I didn’t know there was Cypriot sparkling wines. This is a Xynisteri sparkling wine by Antoniades Winery. And, I am so happy. I’ve never tried this before, I didn’t even know that it existed. Can’t wait to now take this back home and start making those sparkling cocktails. Guys, I have made it back to the house with just five minutes to spare. There is no time for me to change into my special gown, but you know guys I am actually quite excited because look what I found. I didn’t know this even existed. Made with a Cypriot grape, with Xynisteri. Now, I am so excited, I had no idea. Traditional method, champagne style, Antoniades Winery, a small boutique winery. Best of all my friends are gonna get their wish! The first sparkling wine cocktail I’m going to show you how to make is the Mimosa. This is very, very easy. There’s lots of legends around it, about how it was, when it was first invented. One version of the legend has it that this was invented in the Buck’s Club in London in 1921. So you may have heard of this drink also referred to as Buck’s Fizz. It’s the same drink. The Mimosa was invented in the Ritz hotel in Paris in wine. Whether you choose to use champagne or not is entirely up to you and your wallet. The next sparkling wine cocktail I’m going to show you is also known as Pomegranate Spritzer, and you use pomegranate syrup. In this case I am going to use pomegranate molasses and essentially this is cooked-down pomegranate juice. Very, very sweet, but also a little bit sour. You put about a tablespoon at the bottom of each champagne flute and then you top up with sparkling wine. Let me show you how. Very thick, very syrupy, and absolutely delicious. Our third and final sparkling wine cocktail is the Bellini. What you need is the freshly blended pulp of a nectarine or a peach. That gives a better result than just using juice. Again you need about a tablespoon, which is equal to roughly 3 teaspoons. Top it up with your sparkling wine. I don’t have any specialist equipment but I have found that the chopstick does the job brilliantly. Here’s the bell you guys, and my guests are here. This episode about sparkling wine cocktails has turned into quite an epic wine adventure. I need to run now I have a party to host. If you enjoyed this episode remember to leave me a comment, I love talking about wine. Also, If you haven’t subscribed already please subscribe and I will see you guys on the next episode.